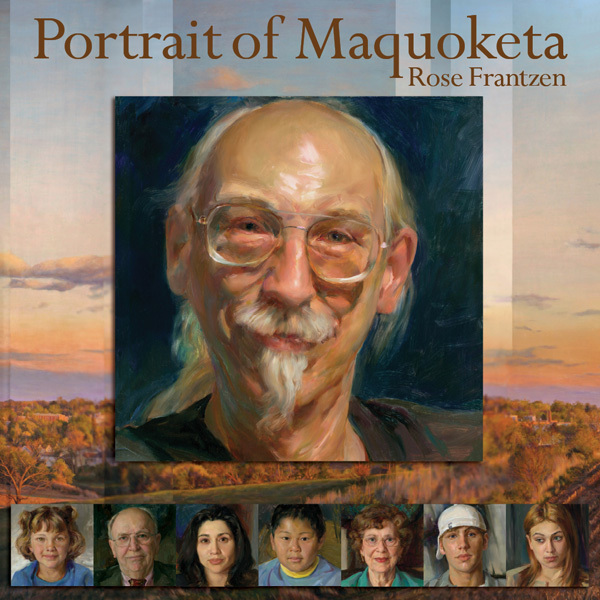 With full color reproductions of all 180 portraits that Rose Frantzen painted of her fellow residents of Maquoketa, Iowa, this 112 page book is a beautiful document of Rose's year-long project in which she invited anyone in Maquoketa to be painted from life. Portrait of Maquoketa was exhibited for eight months in 2009/2010 at the Smithsonian's National Portrait Gallery and is now in the permanent collection of the Figge Art Museum in Davenport, Iowa, where it is shown once every two or three years. Click here for more details about and images of Portrait of Maquoketa. This second edition of the Portrait of Maquoketa book includes essays and comments by Brandon Brame Fortune, Curator of Painting and Sculpture at the Smithsonian's National Portrait Gallery; Richard Schmid, painter and author of Alla Prima; essayist Suzanne Kelsey; Rose Frantzen, commenting on her creative process; a new section on the anamorphic landscape of Maquoketa created for the Figge Art Museum exhibition; and an overview of Frantzen's life and career by her husband, artist Charles Morris. This career overview includes color reproductions of more than 50 works by Frantzen. Also featured throughout the book is a flip animation of one of the portraits, which was photographed every 7 minutes from start to finish. This hardbound coffee table book is 10.5 x 10.5", printed on acid free cover stock on the Heidelberg press at Maquoketa Web Printing in Maquoketa, Iowa and was made possible by a grant from The Ceres Trust. The price for the book is $54.95 and credit card orders can be placed by calling 563-321-1074 from 11 am to 7 pm CST.